We finally got some peaches from our three. The squirrels have been eating all the peaches for the last 5 years. But for the first year the humans are victorious! Well, to be honest we shared the peaches, we got about 20 small peaches, the squirrels got the rest. I wanted to make a peach pie, but didn't have enough, so I had to scale down. So I had to try to make the more rustic peach galette. And Oh Boy, it was good. I'm definitely going to make this again. Add the flour, sugar and salt to a food processor and pulse just until combined. Add the cold butter pieces into the food processor and pulse until small coarse crumbs remain. Whisk mix egg and water together. Drizzle the water/egg mixture over the flour and pulse again until the dough just comes together. Divide the dough in two and wrap the dough disks separately in plastic wrap. Refrigerate the dough for 30 minutes. If you only make on galette, the dough will keep for about 5-7 days in the refrigerator, or you can freeze it. After 30 minutes, preheat the oven to 400 degrees F.
Add the sliced peaches to a bowl. Sprinkle the peaches with cornstarch, sugar and vanilla paste, and toss it all together and let the filling sit for about 10 minutes. Remove one of the crusts from the fridge. Roll one of the pie crusts into a ¼ inch thick disk. It's not important to shape the disk perfectly, you want it to look kinda rustic. Place the dough on a parchment paper lined baking sheet. Spread the grated marzipan in the center, leaving a 2-inch+ border of crust. Layer the peaches on top and fold border of the crust over the peaches. Brush the crust with egg wash, and sprinkle the slivered almonds and some sugar on the crust, and press it into the crust. 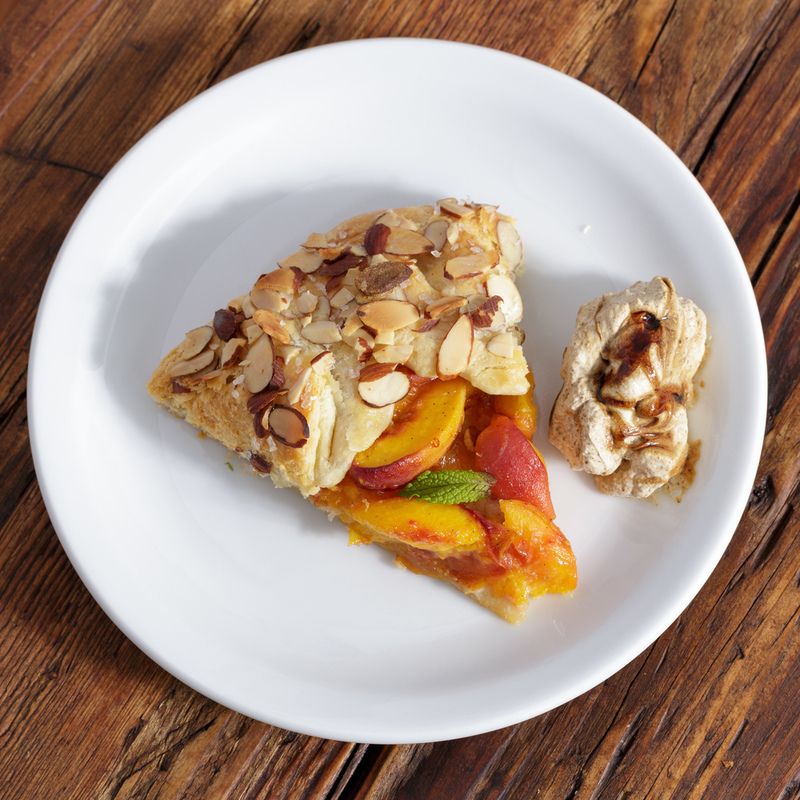 Bake the galette until the crust and almonds are golden, about 40 to 45 minutes. Whip the heavy whipping cream until soft peaks. Fold in the liquorice powder. Sprinkle with fresh mint leaves on the galette before serving. Serve the galette with liquorice whipped cream or a small scoop of vanilla ice cream.